For over two years, lawmakers in Brussels considering a draft Directive on Copyright in the Digital Single Market have been subject to vigorous campaigning on copyright from all sides. Much of the focus has been on two, maybe three aspects of draft legislation under discussion: a new right for press publishers; and an obligation on Internet platforms to check content for potential copyright infringement before it goes online. The ‘maybe’ is text and data mining, which has received less, but still significant attention. Yet there is much more in the proposed legislation. For example, libraries have focused strongly on Articles 3-5, and 7-9, which deal respectively with text and data mining, illustration for teaching, preservation, and uses of out-of-commerce works. Among those articles which have received almost no attention is Article 6. Risking the Rule of Law: What Protections for Technological Protection Measures? Given the dull title – ‘common provisions’ – and the technical-looking wording of the original, this is perhaps unsurprising: the Commission’s original draft read ‘Article 5(5) and the first, third and fifth subparagraphs of Article 6(4) of Directive 2001/29/EC shall apply to the exceptions and the limitation provided for under this Title’. It takes some digging (or a detailed knowledge of generation-old EU law) to work out that this provision refers to technological protection measures (TPMs) – the locks, marks or other tools that control what a user can do with a digital work, such as a book, video or other file. TPMs can help achieve the objectives of copyright protections by making it harder to share or use a work illicitly. The 2001 Directive – the Information Society Directive – makes it illegal to remove or get around TPMs which serve to prevent unlawful uses of works. At the same time, it provides that if TPMs are preventing lawful uses of works, then people can complain about it to their governments to seek removal of the TPM. Confusingly, there is a further somewhat illogical provision (in the fourth paragraph of Article 6(4)) that underlines that when a user has access to a work under mutually agreed terms (i.e. a licence or contract), then this exception to the rule (the ability to make a complaint) does not apply. In short, as soon as a work is licensed (rather than sold), users have no recourse about TPMs that interfere with their rights to make use of exceptions to copyright by preventing them from doing things that would otherwise be legal. Given that many licences are not genuinely negotiable (for example because to have access to the work the only option is to sign, or because the buyer doesn’t have the knowledge or power to negotiate), rightholders of licensed works have a free hand to use TPMs to rewrite the law in their favour. As European Commission research into the experience of teachers using licensed works shows, abuse of the use of technological protection measures is one of the main barriers to full and effective use of digital resources. Article 6 of the draft Directive, in the original, crucially removed this last caveat. It’s effect was to be that even if the work was accessed under contract (for example in the case of academic journals, or eBooks), it lifted the ban on complaining to your government to obtain removal (or simply removing yourself) of TPMs that prevent enjoyment of the copyright exceptions created by the draft Directive. This represented a major step towards ensuring the effectiveness of the law, and to enforcing the rights of users – not least in research organisations and libraries – who already have legal access to digital books, articles, videos and other materials. Yet the amended version of the draft Directive recently voted through by the European Parliament’s Legal Affairs Committee reverses this. Through switching a couple of words, it re-applies the provision that ensures that TPMs applied to licensed works are protected, regardless of the harm they cause to users rights. If this amendment makes it into law, the European Union will have done a major disservice not only to the rights of users and libraries in a digital age, but to the effectiveness of its own laws. The achievement of the goals of the Directive – education, preservation, scientific progress – will depend on the goodwill of private actors, not the rule of law. This is not a healthy or credible means of promoting the public interest. This is not all. Even worse, a further amendment was added to Article 6 and adopted by the Legal Affairs Committee that provides that once an exception has been used to access content, it is not possible to use that content under another exception. This provision appears to be a reactionary attempt to circumvent the TU Darmstadt ruling of the Court of Justice of the European Union, which made the (limited) step of allowing libraries to digitise copies of works in their collections (even when a digital version of the same was on the market) and give their users access to those digitised copies via dedicated terminals within their premises. It also allowed students and researchers to make printouts, as long as these were permitted under copyright exceptions. For libraries, researchers and students, this was a logical step, facilitating public interest activities by opening new possibilities for access, especially when terms offered by publishers did not meet needs. Yet it was a limited step unlikely to cause any unreasonable harm to rightholders’ interests. The amendment proposed in the Legal Affairs Committee’s current version of Article 6 would not only reverse this decision, but goes much further. It appears to have been accepted by the Committee without understanding that this amendment undermines the function of exceptions and limitations in the legislative regimes of EU Member States, long established under international copyright treaties. The Committee also seems to have given no thought to the harm it will do to libraries, archives, research and cultural heritage institutions. Even if only applied to the limitations and exceptions covered by the draft Directive, it implies that, for example, once a work has been subject to preservation copying (i.e. to copy a sound recording from vulnerable media such as audiotape or vinyl to digital form), then it can no longer be used for text and data mining. Nor could it be used for teaching purposes, significantly harming education programmes making use of vulnerable 20th century content. Efforts to use old sound recordings and film reels could be forced to stop (unless additional licensing fees are paid), as could programmes involving materials such as soldiers’ letters from the First World War. Instead, once a work had been preserved, it would effectively be locked away until it entered the public domain, regardless of the nature of the use of the work. This amendment must be removed if the European Union is not to mark the European Year of Cultural Heritage by delivering a serious blow to the institutions working to preserve and celebrate this. The harm that would be done to research and education is immeasurable. As highlighted in IFLA’s own commentary on the version of the draft Directive voted through by the Legal Affairs Committee, there are positives and negatives. Progress has been made on the specific exceptions applying to libraries and cultural heritage institutions, even if this falls short of what was necessary. Amendments to the most controversial Articles (11 and 13) may well protect non-commercial library activities, although these articles still run violently counter to broader library values. 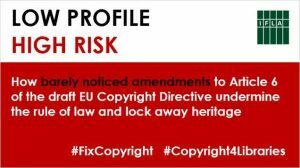 In the middle of this, it is important not to forget other elements which, for all that they appear dull and technical, risk doing major damage to our sector and to the copyright framework itself. The Legal Affairs Committee’s amendments to Article 6 must be rejected and the Commission’s original text restored. There was an amendment submitted by MEP Julia Reda that would solve the problem with technological protection measures. The InfoSoc directive defines TPMs as “any technology, device or component that (…) is designed to prevent or restrict acts (…) which are not authorised by the rightholder (…)”. The idea of the amendment was to update this definition and add something like “and which are not authorised by national or European law”. This is a good solution because it allows the exercise of copyright exceptions (education, research, opinion, libraries, etc.) with works with TPMs/DRM while at the same time protects rightholders from acts not authorised by them or not authorised by law. This amendment was submitted at IMCO committee and was rejected by only one vote. It was also rejected at JURI’s, don’t know by how many votes. We will ask Portuguese MEPs to submit or to support this change, but the majority of PT MEPs didn’t even rejected the mandate so not sure if we’ll be successful. Talking to MEP Julia Reda and other MEPs to submit and/or support this amendment again would be great. Let me also add we got a very similar solution to TPMs problem in Portuguese law last year. Some associations in Portugal fought DRM/TPM for many years, but it would be much more interesting and fair if this could be an European solution. You’re completely right – Julia Reda’s amendment would improve things, although the Commission’s original text is already a good start. It’s important that MEPs understand that by allowing TPMs to override exceptions, they are weakening the impact of the laws they pass themselves!